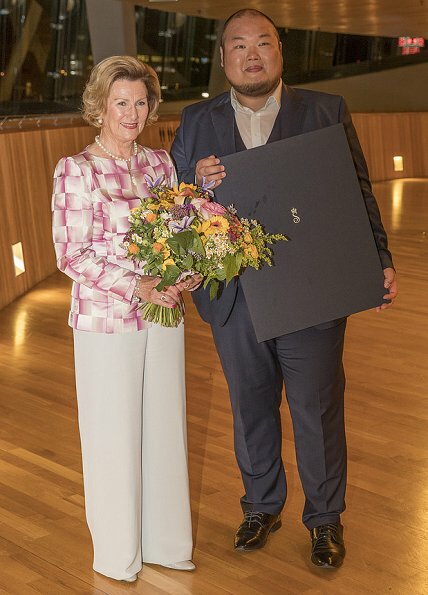 Queen Sonja attended the final of "The Queen Sonja International Music Competition" held at the Norwegian Opera and Ballet House in Oslo. 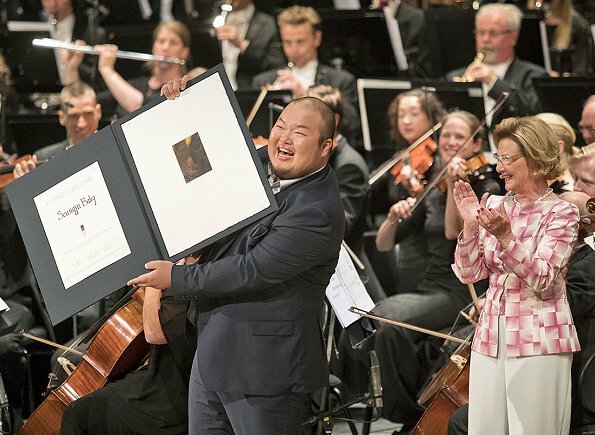 Tenor Seungju Bahg from South Korea, won first prize grand final. The second prize went to tenor Giovanni Sebastiano Sala from Italy, and the third prize went to Belarussian bass Alexander Roslavets. Is there more pure joy than the face of that winner of the grand prize? The queen looks lovely in that blouse, a good color for her, but I think a long skirt might have been a better choice than slacks. My opinion- you are absolutely right K Hass and Cathrine. She is lovely except for the slacks; they're just too big and too long. Für die 80+ Generation ist Königin Sonja ein Vorbild. Tolles Oberteil mit einem der Figur schmeichelnden Schnitt und sehr hübscher Farbzusammenstellung. Perfekt dazu die Marlenehose. Miss Dietrich wäre stolz auf Sie! Those palazzo pants work well with the blouse, very elegant outfit and age appropriate.